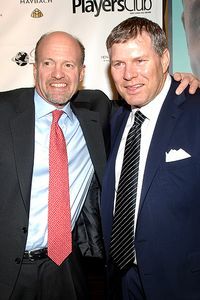 Update March 12, 2012: Back in 2009, I warned about how former professional baseball player Lenny Dykstra was being touted by Jim Cramer for his supposed investing prowess. In recent years, Dykstra has been in a heap of financial and legal troubles. A recent ABC News article provides the following new "highlights:"
"Disgraced ex-New York Mets outfielder Lenny Dykstra (photo below) on Monday was sentenced to three years in a California state prison after pleading no contest to grand theft auto and providing a false financial statement. ...Dykstra initially pleaded not guilty to 25 counts after police arrested him and found cocaine, Ecstasy and synthetic human growth hormone at his Los Angeles home last April. He changed his plea in October to no contest and in exchange prosecutors dropped 21 counts. ...Dykstra still faces federal bankruptcy charges and is scheduled to stand trial this summer. He filed for bankruptcy a few years ago, claiming he owed more than $31 million and had only $50,000 in assets. Federal prosecutors said that after filing, Dykstra hid, sold or destroyed more than $400,000 worth of items from the $18.5 million mansion without permission of a bankruptcy trustee. Dykstra, who spent his 12-year career with the Mets and Philadelphia Phillies, also has pleaded not guilty to indecent exposure charges for allegedly exposing himself to women he met on Craigslist." "Former Mets outfielder Lenny Dykstra deserves his fall from icon to inmate, his brother told the Daily News. Brian Dykstra said Monday that he figures his once high-flying, now bankrupt brother is at least partially guilty of the fraud and theft charges levied against him last week. ...Brian said Lenny's friend and former bookkeeper Dorothy Van Kalsbeek reached out to relatives in an email that detailed the arrest and his search for a lawyer. ...He and younger brother Kevin have been estranged from Lenny since the former All Star player sold his car-wash business and allegedly reneged on money he owed them. The now broke ex-baller was arrested at his Encino, Calif., residence Thursday for allegedly buying cars with fraudulent paperwork, Los Angeles police said. In a separate case filed a day earlier, federal prosecutors accused him of embezzling $400,000 from his bankrupt estate, which includes an $18.5 million mansion purchased from hockey star Wayne Gretzky. Dykstra, 48, illegally sold a "truckload" of furnishings - including chandeliers, mirrors, a grandfather clock and fireplace screens - from the Gretzky house shortly after filing for bankruptcy in 2009, federal investigators claim. Once a highflying stock picker and vanity magazine mogul, the now-divorced Dykstra spent the weekend in county jail and moved to a Van Nuys courthouse Monday to get picked up by the FBI, sources said. The Los Angeles County District Attorney said the feds will get first crack in a courtroom." In the past when I visited Jim Cramer's web site, TheStreet.com, I remembered being puzzled seeing financial advice being offered by former Major League Baseball player Lenny Dykstra. Mind you, I never found his advice useful. He simply added to the noise of the day analysis of the stock market. He advocated risky trading strategies and often made unsubstantiated claims about the supposed profitability of his trading recommendations. It was clear to me that having a Dykstra column was simply a Cramer marketing gimmick to draw in unsophisticated stock market followers who happened to be sports fans. At the April 2008 launch party for The Players Club, Jim Cramer had high praise for Dykstra's stock picks. Now comes word that Dykstra has filed for bankruptcy! How's that for solid proof of how his risky investing recommendations have turned out for himself and his followers? This ESPN article, written before Dykstra's bankruptcy was filed, is a detailed summary of Dykstra's dysfunction, including his rise to investment fame thanks to Jim Cramer.